Kick off your visit on the 6th (Mon): steep yourself in history at Sabarmati Ashram / Mahatma Gandhi's Home, examine the collection at Calico Museum of Textiles, contemplate in the serene atmosphere at Koteshwar Mahadev Temple, then take in the spiritual surroundings of Jami Masjid, and finally don't miss a visit to Magen Abraham Synagogue. To find other places to visit, traveler tips, photos, and other tourist information, use the Ahmedabad trip itinerary maker tool . If you are flying in from India, the closest major airport is Sardar Vallabhbhai Patel International Airport. May in Ahmedabad sees daily highs of 50°C and lows of 32°C at night. Finish your sightseeing early on the 6th (Mon) so you can travel to Denpasar. Kick off your visit on the 7th (Tue): stop by Krakakoa Chocolate Factory & Store, get outside with Outdoor Activities, and then contemplate in the serene atmosphere at Tanah Lot Temple. Get ready for a full day of sightseeing on the next day: get your game on at Tilo Kids Club and then cool off at Waterbom Bali. For photos, ratings, reviews, and other tourist information, use the Denpasar day trip planner . You can fly from Ahmedabad to Denpasar in 10 hours. Another option is to do a combination of bus and flight. The time zone difference moving from India Standard Time to Central Indonesia Time is 2 hours. Expect cooler weather when traveling from Ahmedabad in May: highs in Denpasar hover around 36°C, while lows dip to 28°C. Finish up your sightseeing early on the 8th (Wed) so you can go by car to Ubud. Start off your visit on the 9th (Thu): experience rural life at Tegalalang Rice Terrace, identify plant and animal life at Elephant Safari Park, then take in the spiritual surroundings of Tirta Empul Temple, and finally Head underground at Elephant Cave Ubud. Keep things going the next day: indulge in some personalized pampering at some of the best spas, identify plant and animal life at Sacred Monkey Forest Sanctuary, then take in the exciting artwork at Threads of Life, and finally contemplate in the serene atmosphere at Saraswati Temple. To find maps, traveler tips, and tourist information, you can read our Ubud trip itinerary planner. Ubud is very close to Denpasar. In May, plan for daily highs up to 36°C, and evening lows to 28°C. Wrap up your sightseeing on the 10th (Fri) early enough to travel to Singapore. Singapore is known for parks, shopping, zoos & aquariums, museums, and nightlife. Your plan includes some of its best attractions: admire the natural beauty at Gardens by the Bay, hike along The Southern Ridges, enjoy breathtaking views from Singapore Flyer, and walk around Singapore Botanic Gardens. To see photos, maps, and tourist information, read our Singapore online trip maker . Traveling by flight from Ubud to Singapore takes 6 hours. May in Singapore sees daily highs of 38°C and lows of 30°C at night. Finish up your sightseeing early on the 13th (Mon) so you can travel to Kuala Lumpur. Start off your visit on the 14th (Tue): browse the different shops at Central Market Kuala Lumpur, stroll around KLCC Park, then explore the fascinating underground world of Batu Caves, and finally admire the striking features of Petronas Twin Towers. Keep things going the next day: enjoy breathtaking views from Menara Kuala Lumpur, walk around KL Bird Park, and then see the interesting displays at National Museum. 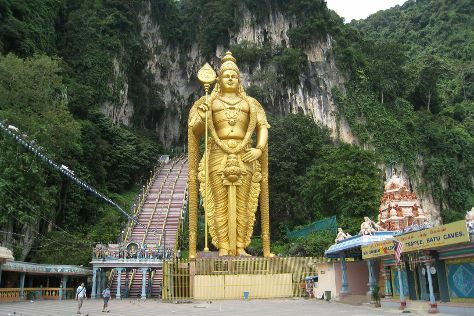 For more things to do, reviews, photos, and tourist information, refer to the Kuala Lumpur day trip planning site . Getting from Singapore to Kuala Lumpur by flight takes about 3.5 hours. Other options: drive; or do a combination of bus and flight. May in Kuala Lumpur sees daily highs of 39°C and lows of 28°C at night. Wrap up your sightseeing on the 15th (Wed) to allow time to travel back home.